Would you like to visit the Alps, but don’t have the money or passport to travel to Europe? Though it typically lacks lederhosen, Hurricane Ridge might make a great alternative. With breathtaking views of beautiful forests, meadows, and snowcapped mountains in the summer and a quiet, snow blanketed valleys in the winter, Hurricane Ridge is a worthy viewpoint year-round. Two great Hurricane Ridge viewpoints are the Hurricane Ridge Visitor’s Center and the Hurricane Hill Trailhead at the end of Hurricane Ridge Road. Hurricane Ridge is located in the in the northwest of Olympic National Park, just south of Port Angeles. The ridge features stunning mountain and water views. What can I see from Hurricane Ridge? Olympic Mountains: The glaciers and snowcapped peaks of the Olympic Mountains tower imposingly over Hurricane Ridge visitors. 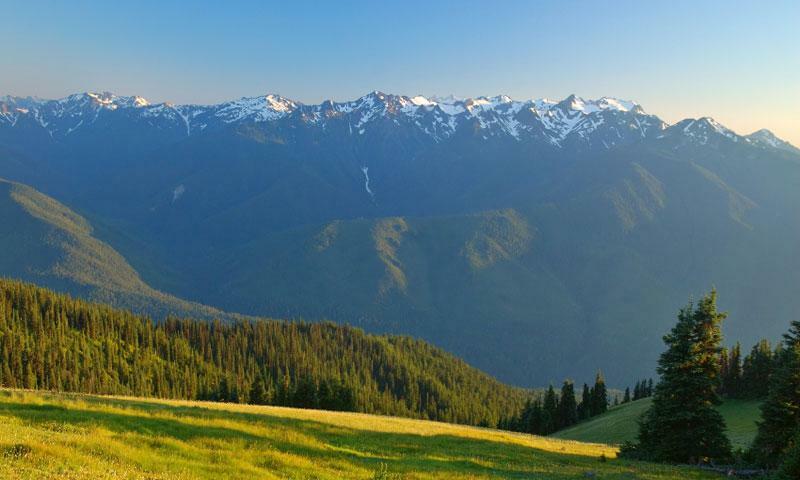 Hurricane Ridge has amazing views into the beautiful forests, meadows, and valleys of the Olympic Mountains as well. In the summer, the meadows are speckled with purple wildflowers. Where is Hurricane Ridge, WA? Hurricane Ridge is located in the northern region of Olympic National Park, just seventeen miles south of the city of Port Angeles. From Olympic Highway, WA-101, drivers should turn south onto Race Street. Race Street will become Heart O’ the Hills Road/Hurricane Ridge Road. Watch for signs for campgrounds, the Hurricane Ridge Visitor’s Center, and trailheads. When is Hurricane Ridge, Washington open? In the late spring, summer, and early fall, Hurricane Ridge is open during daylight hours, seven days a week. In the winter the road is typically open from 9 am to dusk, with the exception of weather/snow closures. The road is also closed on December 25th, Christmas Day. To see if the road is open and current conditions, one should call the Olympic National Park Road and Weather Hotline at (360) 565-3131. How much does visiting Hurricane Ridge (Olympic Park) cost? Visitors must purchase a $25.00 Olympic National Park entrance pass at the Heart O' the Hills entrance station. The pass is good for entrance to the entire Olympic National Park for up to a week.